We are living in a time of political tumult and moral disgrace. Political leanings aside, there is no way to reconcile our social work values with the behavior of those who lead us. Integrity has yielded to moral brokenness; truth is elusive; and our basic sense of safety is challenged. We ask our students to raise their voices for social justice, and we aspire to be their role models in so doing. In this recent chapter in our history, the task at hand is the proverbial boulder to be pushed up a mountain. This study was designed to explore Master of Social Work programs’ policies when admitting students with criminal backgrounds and the implications of this practice for field directors. The issue of students with criminal records is a challenging one for social work programs and the responsibility is often left solely to the field director. In this study, field directors participated in an online survey related to perceived challenges, gate-keeping practices, and policy development. Findings and recommendations are discussed. Historically, social work practice has occurred within the confines of what can be described as a bidirectional flow of social justice. Along with great strides forward, setbacks occur. Nevertheless, the unrelenting call for social workers to fight for social justice and to educate others for this fight remains the same. A deeply rooted commitment within the Grand Challenges of Social Work stems directly from the profession’s fundamental principle of promoting social justice and equal opportunity for all (Uehara et al., 2013). Schools of social work strive to not only educate students to understand the ways in which privilege, oppression, marginalization, and powerlessness contribute to systematic inequalities, but also to fulfill the profession’s mission by equipping students with the knowledge and skills needed to promote social justice (Finn, 2016; Reisch & Garvin, 2016). Whereas classroom instruction can successfully teach the concepts of social justice, translating this theoretical knowledge to practice in real-world settings is an essential component of social work field education (Battle & Hill, 2016). Given the experiential, hands-on nature of the field practicum, field education programs are uniquely positioned to shape students’ self-identities as social work professionals and enhance students’ understanding of social justice work in action. During the field practicum, students gain firsthand experience in applying a social justice lens to their practice of social work through direct interactions with field instructors, client systems, field advisors, and other social work students. In 2008, the Council on Social Work Education’s (CSWE) Educational Policy and Accreditation Standards (EPAS) identified field education as the signature pedagogy of social work education. As social work educators, we are charged with providing students the opportunity to learn and to be successful in the field, while also acting as gatekeepers of the social work profession. Currer (2009) suggests that it is critical to find a balance between “allegiance to individual learners” and protecting the profession of social work and its future clients. However, current literature provides little guidance as how to best assist students who are not successfully demonstrating the competencies in their field placements. This paper will discuss how the University of Illinois at Urbana-Champaign (UIUC) School of Social Work Field Education Office developed a remediation process for addressing (and preventing) placement issues and assists students in connecting the competencies with their performance in field. Educational institutions face many social, political, and environmental influences that affect their operations. For example, higher education programs have remained competitive by launching online educational opportunities. As a result, institutions are now able to reach a maximum audience, increasing both accessibility for students and profitability for education providers. Social work has embraced online education in part to respond to the increasing demand for master’s level social workers (Council on Social Work Education [CSWE], 2017) and as a way to increase the number of social work professionals in previously underserved rural and remote communities (Cummings, Chaffin & Cockerham, 2015; Reinsmith-Jones, Kibbe, Crayton & Campbell, 2015). As with most businesses, schools of social work must be aware of the external environment and act nimbly if they wish to maximize quality and minimize barriers for students. As social work education relies heavily on the goodwill of community-based agencies to host students for their 900-hour internship requirement (CSWE, 2015), social work administrators need to pay attention to the impact of their own internal organizational changes on external agency partners. Additionally, change in the structure of external agency partners necessitates change in the social work program (Rothwell, Sullivan, Kim, Park, & Donahue, 2015). Staying current with scholarship enriches the work of field educators: it teaches us innovative ways to solve perennial field problems, suggests new readings for field seminars, keeps us abreast of current debates in social work education, and even inspires us in our own writing on theory and research. 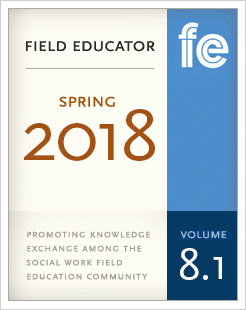 “What We’re Reading” presents our brief summaries of the findings of recent publications in field education. Our emphasis is on implications for practice. Readers are encouraged to suggest articles or books for future review.